Recipient: Her grandfather Frank for his 88th birthday. Samantha was inspired by her grandfather’s native garden in suburban Sydney which was somewhat ahead of its time, filled with grevilleas, banksias, native grasses, tree ferns, massive gum trees and paperbarks that attracted a multitude of birds and also possums. 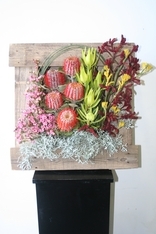 Her arrangement features reds and yellows (provided by Banksias, Leucadendron ‘Safari Sunset’, Leucospermum, Grevillea, bud wax and kangaroo paws), the colours of the sunsets which encouraged grandfather to sit in the garden and watch the birds feeding and the possums venturing out. She used paperbark to cover the container, remembering how she would collect cicada shells from these trees as a child. Orchids were added to recall her grandfather’s large orchid collection. Samantha has focussed on the different and contrasting textures provided by the plant materials selected, and considered the roles of positive and negative space, repetition and movement in her design. Shirley called her design ‘Sun and shells’ to reflect her father’s love of going to the beach to relax and unwind. She used a basket for the base and extended its colour and texture by making an armature (a sculptural framework) to highlight the design and add height with a ‘net’ to hold shells. Warming tones of red, pink and gold, provided by Leucadendron ‘Safari Sunset’, golden wattle, proteas and vanda orchids, were used to evoke the warm feeling of being on the beach, and her warm love of her father. Claire’s symmetrical design featured analogous colour harmony of yellows and reds, which she feels are more masculine colours. She used groupings to create interest and movement and noted the different actual and visual textures provided by the plant materials. 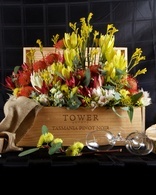 She based her arrangement in a boat shaped vase that is placed within a timber wine box. Her staging of the design was impressive. Caitlin’s entry connects to her grandmother’s life on a farm, where there was a walking track through the bush which she used to wander daily with her blue heeler. When not in the bush, she was out in her garden. Based in a large black ceramic pot, Caitlin created a front facing radiating arrangement using groupings of Leucadendrons, Banksias and proteas, adding flax to add height and backing to the design. She used pieces of Didgery SticksTM from Premium Greens Australia to make two tatami, one short, one long, to wind through the design to allude to the path. She added hypericum berries and umbrella fern to carry through the bright green of the tatami. Mandy called her design – ‘Australia – Picture perfect’. It’s a tribute to her grandfather who emigrated to Australia aged 68 and fell in love with our flora and fauna. He inspired Mandy and always said ‘you should be a florist’. Mandy made a frame out of recycled fence palings, again in tribute to her grandfather who loved to do woodwork. 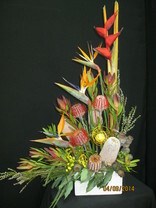 Within the frame she placed a range of Australian and South African wildflowers, grouping them to showcase the flowers as they would be seen in nature and with shortest to tallest left to right, with spear grass forming an arc across the top. Bridget created her design for her father who enjoys travelling and appreciates his bushy, bird-filled garden. 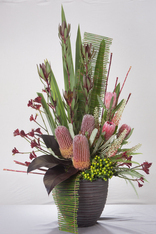 Australian species (wattle, gum nuts, Banksias, waxflower, Melaleuca and Thryptomene) are joined by two South African relatives (Leucadendron salignum and Brunia), while lobster claws and bird of paradise add dazzling colours and exotic flower forms. These are her father’s favourite colours and forms, and were added to link to his ‘worldly travels’.